I’ve mentioned a few times that I’m part of a couple all girls groups on Facebook. In one group, all of the posts have to be approved by the admins, so it’s generally good content. The other group…not so much. One girl mentioned being on the quest for her first full time job…at twenty-six years old! Anyway, there are a ton of wedding questions that come up, and I almost always have a sassy answer in mind (but I never share). 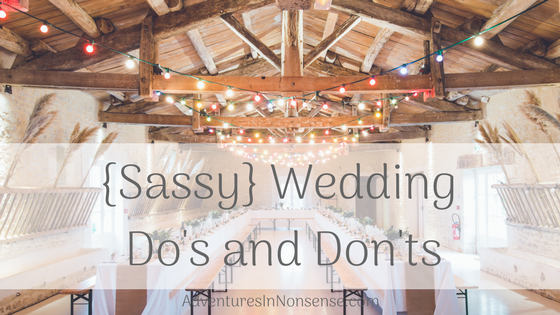 So, for all you brides or future brides out there, here’s one round of Sassy Wedding Do’s and Don’ts. Do hydrate your guests. That’s great that you have a lot of heavy drinkers coming to the wedding…make sure you have some water too. Don’t have a formal wedding before 6:00pm, especially in the summer weather. Are you really going to ask your guests to be in gowns and tuxedos when it’s 90 degrees outside? Don’t have a wedding party of 20 or more. Hell, any more than 5 per side is a bit excessive. Do feed your guests. Unless you’re having a 2pm wedding with a cake and punch reception, there should be some sort of food or snack at your wedding. Don’t hire a vendor who asks to bring a plus one. They’re there to work…not have a “paid party” with their boyfriend or girlfriend. Do have a wedding hashtag, but don’t make it forever long. No one is going to want to add #SmithFoundHerHusbandAtBaylor for a hashtag. Don’t register for seasonal things! I had a colleague who got married in December, and 60% of their registration was for Christmas items. Do be on time, or close to on time. Conversely, don’t leave your guests waiting an hour and a half for dinner. Caterers buy, cook, and plan food based on your timeline. You don’t want to run out of hors d’oeuvres or serve a cold buffet. I have plenty more sass where this came from. Chances are, your wedding planner will just roll with the punches, but know what’s appropriate too. Looking for a sassy answer to any of your wedding questions? Just ask! I also have non-sassy answers because I love weddings and celebrating love.